I have been looking around for different makes of solid fuel stoves sold in Ireland, and the latest I have come across is a range marketed under the brand name of Hamco. Hamco Enterprises Ltd. operate from Tullamore County Offaly. 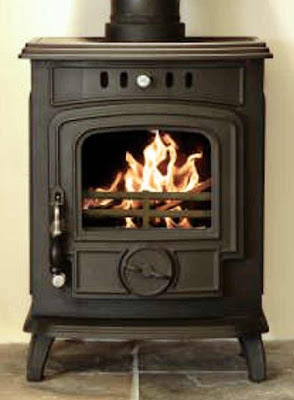 Hamco sell an extensive range of their own branded stoves and in addition carry the Franco Belge range of stoves. My readers may have noticed that I have been looking closely at two particular types of stove. (1) Inexpensive small freestanding 6 to 7Kw stoves, and (2) Inset Stoves that can be easily fitted into an existing fireplace with a minimum of work. I believe that fitting stoves like these in the 100,000 or more open fires in Ireland, would do more for sustainability than all the fancy-schmancy and expensive schemes put together by SEAI (The Sustainable Energy Authority of Ireland). I had a nice conversation with Hamco’s Brian McMahon who was most informative and well versed in his subject. Brian told me that Hamco are about to release an inset stove, and here is the good part, the recommended retail price will be only €620 inc. VAT. That means It should be completely feasible to purchase one of these stoves at around €550. Hamco have their castings done in China the same as Blacksmith and Mulberry. The grates are in the same quality of high chromium iron 17% chromium, giving them longer life. Next time a closer look at some Hamco Stoves.